When I got older and moved out on my own, I began making this delicious dessert on my own. When you’re living on a budget with minimal extra spending money, as I was when I first moved out on my own, fancy desserts and expensive meals weren’t something I could always enjoy. But pudding pie ingredients are super cheap and often on sale. Which made me happy. It meant I could enjoy one of my favorite desserts! Now that I’m a little older (well, not that old – I’ll be turning the wee age of 32 next month) and I make a somewhat decent living, I can afford to dine on the finer things in life. But that doesn’t stop me from craving chocolate pudding pie. So a few weeks ago I decided to get creative with pudding pie. Ah yes, creativity with pudding pie. It’s a wonderful thing! 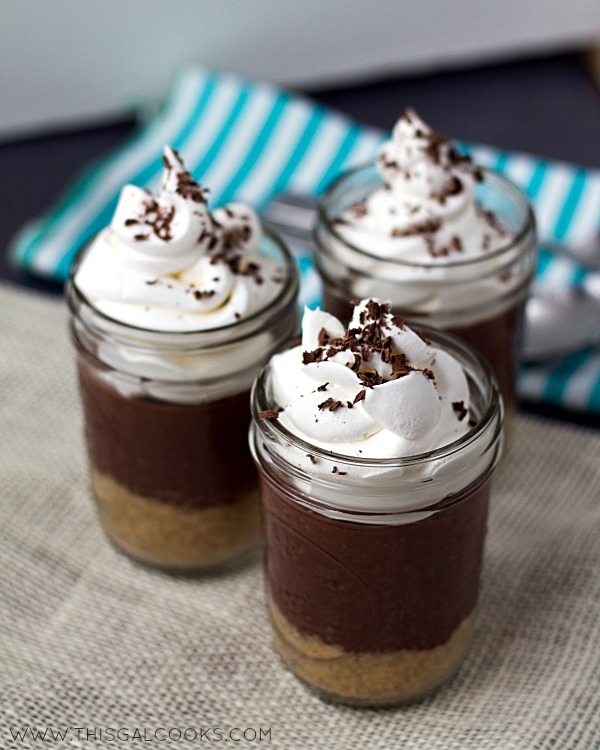 It resulted in this cute little Chocolate Pudding Pie In A Jar recipe! Don’t you wish you had one right now? Mix together the sugar, graham crackers and melted butter. Press into the bottom ¼ of 4 6oz mason jars. Mix together the milk and pudding mix. Pour into each jar up to the beginning of the rim. Cover and refrigerate for 20-30 minutes. Top with the Cool Whip. I put the Cool Whip in a ziplock bag and cut off the corner so I could squeeze the Cool Whip into the jars and make it look fancy. Top the cool whip with the shaved chocolate. On my way into the grocery store right now to buy what I need for this recipe!!! What an adorable idea!!! I hope you enjoyed the recipe, Christine! This kind of dessert always takes me back to my childhood. 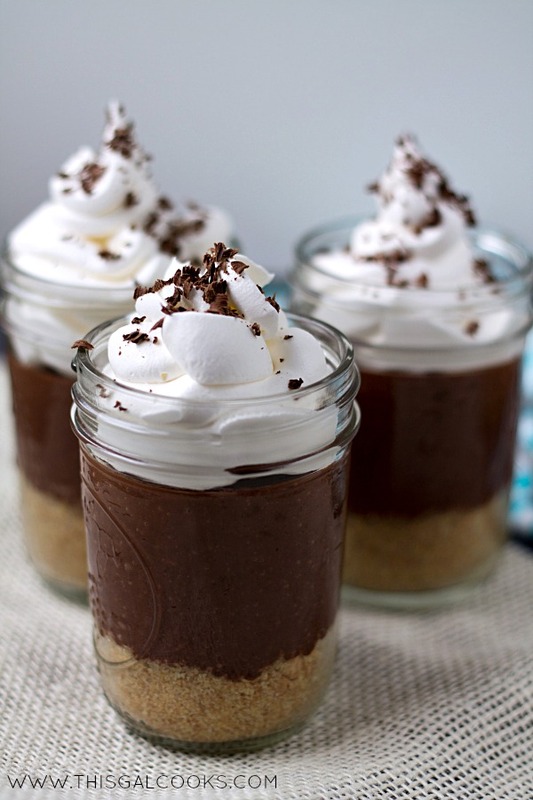 I’ve always been a huge fan of pudding with whipped cream and graham cracker, and it reminds me of a favorite dessert my late aunt used to make. These look so delicious! Thank you so much, Tina! Trust me, I’ve accidentally purchased the cook & serve before. When you’re in a hurry, it’s easy to do but a bummer when you realize it! I have a weakness for any dessert in a jar! These look fantastic! So cute- everything is always better in a mason jar! Childhood desserts are the best. We are never too old for them. This looks great Julie and I am pinning! Thank you so much, Zainab! What a cute idea Julie. Pinned! Oh my gosh, these are so cute! I’m loving all your desserts in a jar. This looks awesome, I can literally taste the creamy chocolate in my mouth now! Pinning. Look how crisp those chocolate sprinkles look, great photo! Love the recipe, my husband would love this! Why yes, I do wish I had one RIGHT NOW! Pudding pie for me brings memories of my grandmother. It was her standby dessert at family gatherings. She’d make two because she knew I’d have more for breakfast the next morning! I love chocolate pudding Julie! And love this idea of it in a pie form in a jar. So cute and very clever –pinning! :) Have a great week! It’s might be cheap, but you really class it up with the presentation. The little portions are so cute. I love how you can see all of the layers! Julie, these are so cute! 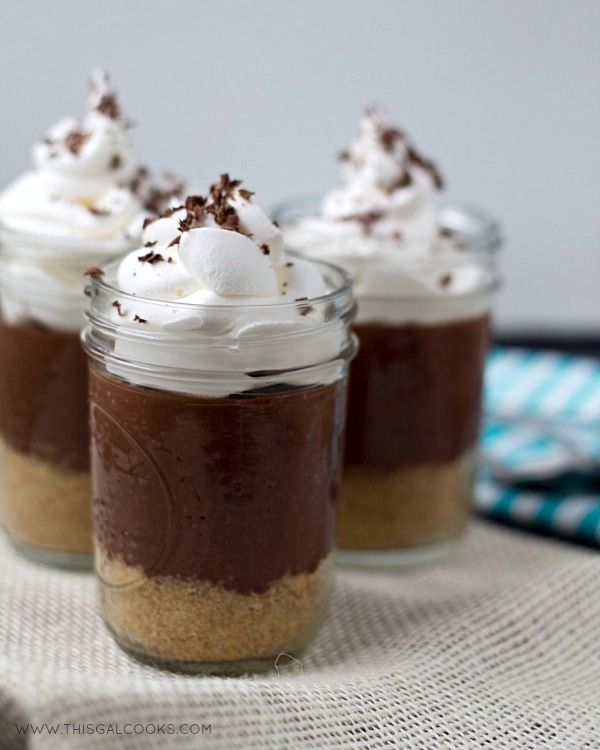 And you’re totally right–the combination of graham crackers, pudding, and whipped topping is really hard to beat. I am such a fan of quick no-bake desserts :) Stopping by from Time to Sparkle! Thank you so much for stopping by and for the compliment! :) Hope you have a great weekend. It’s definitely inching closer! hi love all the recipes so yummy and easy which is a good combination found you through the cast party hop I’m Lorraine at http://lorrainesresources.blogspot.com following on google+ thanks for sharing. I love chocolate so you can imagine my eyes when I saw this Julie! It looks so delicious. I could have some right now. This IS calliing my name. It looks absolutely fantastic, Julie. Pinned! I think there’s a typo. I’m doing it now and 13.9 oz of pudding seems like an awful lot for only 1 3/4 milk. I’m horrible at cooking/baking so I really don’t know which is right… Just seems off. But I love the recipe though! Hopefully it turns out well. No problem! That’s what I assumed and it worked out perfectly!! I did these in champagne flutes because it was new years but everybody went crazy for them. Thanks for the awesome recipe that I will definitely do again. Disappointed when went for a recipe and found instead instructions on how to use mixes. If you actually have a recipe to make this (ie. ‘from scratch’) I’d be interested. No recipes for “from scratch” as of yet. As noted in the post, this was inspired from the pudding pies my mom used to make when I was a kid. They came from mixes. This is supposed to be a quick and easy recipe, hence the use of the mixes. if ya make these the day before will the crust go soggy? This looks so delicious! I’ve got to try this! Thank you, Stephanie! LOVE these. They are so much fun! I’m making these for a baby shower tomorrow – if I go ahead and put the cool whip on and refrigerate overnight, will it be ok or should I wait to do the cool whip until tomorrow? I just tried your recipe and used Nakpunar 8 oz mason jars. Filled little less and closed the lid to store them. My family loved it!!! Thank you for the recipe.